Jerry Lee Duplantis, native of St. Martinville, Louisiana, was the son of a sugar cane farmer. He was raised on Bayou Teche along with his nine siblings. Family has always been important to Jerry Lee and remembers as a child loving to watch his father and older brothers cook cajun cuisine. In 1973 Jerry Lee moved to Baton Rouge as a surveyor for the U.S. Soil Conservation Service. There he met his wife, Debbie Jones Duplantis. In 1978 along with his father in law, they purchased a meat market and convenient store called Kwik Shop at 12181 Greenwell Springs Road in Baton Rouge, Louisiana. 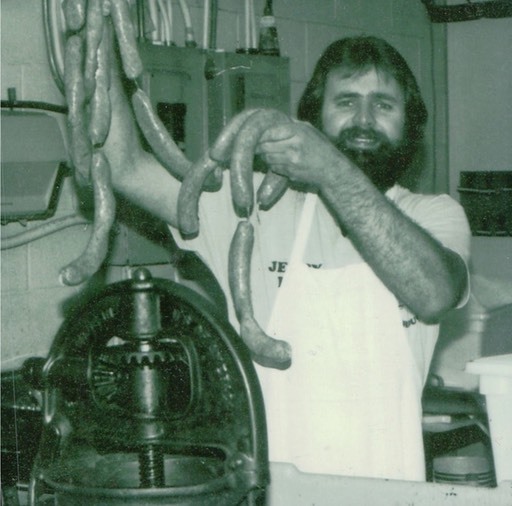 After a short while, Jerry Lee went into business for himself and his passion for cooking along with his Cajun French Heritage led him to try his hand at the cajun specialty, boudin. He hand-stuffed many trial batches and received feedback from many of his "regulars." After perfecting his secret recipe of now over 33 years, he hopes that Jerry Lee's Cajun Foods will remain a family tradition. Jerry Lee was joined by his daughter, Annie, in 1995 and his son, Jerry Jr. in 2001. He has also been blessed with faithful employees two of whom have been with Jerry Lee since the very beginning, Terry Eldridge and Steve Cangelosi. The convenient store sign soon changed to "JERRY LEE'S CAJUN FOODS" and is currently making 600 to 1000 pounds of boudin a day using a water-powered stuffer to stuff fresh pork, rice, vegetables and cajun spices. Jerry Lee has grown his menu to include other customer favorites...fresh fried cracklins, pork skins, hog-head cheese, beef jerky, green onion sausage, and Italian sausage. In just a short time, word of mouth brought long lines of hungry customers wanting to try the famous Jerry Lee's Boudin. LSU Football season, Thanksgiving and Christmas Holidays more than double the customers who anxiously include Jerry Lee's as part of their festivities and traditions. Unstuffed boudin, sold as a rice dressing has become a "must have" for the Thanksgiving and Christmas dinner table. The team at Jerry Lee's cook around the clock to ensure that we have the freshest and highest quality products. It will be hot and waiting for you when you arrive. Six days a week and open at the early hour of 5:00 a.m., call ahead or come in and shop with us today! With gratitude from our family to yours for 33 years of successful business...may God bless!